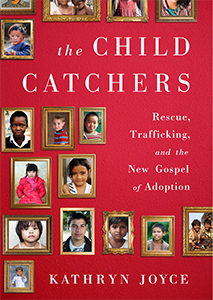 Today we continue our discussion of the new book by investigative journalist Kathryn Joyce, The Child Catchers: Rescue, Trafficking, and the New Gospel of Adoption. Yesterday, we talked about God's will in adoption and the moral imperative to adopt. In this installment, we focus on domestic adoption and the rebranding of adoption via specific language. We invite you to join the conversation in the comments following each post. Lynn Grubb: As we have seen in the history of adoption (Orphan Trains, Georgia Tann in Tennessee, and currently in all the countries who have closed to international adoption) there is a theme. The theme is exploiting the poor, the young, and the ignorant (as in they don't even know what U.S. adoption actually is because it doesn't translate into their language or culture) . . . the common theme being resources. The families who took in the orphans from the Orphan Trains many times used the children as indentured servants, similar to what we saw in this book. Georgia Tann was in cahoots with a local Judge and together they made untold amounts of money off wealthier adoptive parents. Many children were stolen, as outlined in the book. I personally believe (and I am a Catholic and a Christian) that Christianity within the "Orphan Crisis" is being used as a smoke screen to convince many-times naive, decent adoptive parents to spend years dealing with an international system which is clearly corrupt at this point under the guise of doing God's work. Some of these families believe what they are doing is right. But I suspect a broader political motive behind Rick Warren's church and the movement itself. Rebecca Hawkes: I'm glad you mentioned Reanne. She's been much on my mind. I found her story to be particularly poignant, no doubt in large part because I too am the daughter of a mother who was simply "young." The coercion that Reanne experienced during her pregnancy was familiar but heartbreaking. (“’Everything is so negative and subtle, and it starts to work on you,’ said Reanne. ‘I felt like I was walking around with a baby that wasn’t mine. I was a birthmother before the child was born.’”) Also, as I read about her actions through the years in her attempts to reconnect with her son and re-open an adoption that had closed, I was aware that she was that nightmare "birthmom" that so many adoptive and prospective adoptive parents fear, the one who won't go away and even shows up on the doorstep, so it was good to get that story from her perspective. It's noteworthy that although Reanne acknowledges the harmful impact of a religiously affiliated organization that orchestrated her relinquishment, she herself maintained and even deepened her own faith. It's a significant moment for her when an evangelical preacher tells her, "That child was taken from you . . . They said you weren’t good enough. This is what religion has done over and over." For us, as readers, it's an important reminder that not all evangelical Christians are blind to the harmful impact of current adoption practices. I think it's important for readers of this round table to understand that we're not engaging in Christian-bashing or evangelical-bashing. We need to be able to look critically at certain harmful practices, especially when they have become widespread and are being cloaked in religious garb, but that's not the same as indicting an entire religion or group of people. One of the things I've found especially encouraging since this book's publication is the number of Christian bloggers and writers who are coming forward to essentially say, "This is a difficult and controversial book but we shouldn't just dismiss it without reading it and discussing it. There are things in here that we need to be discussing." Carlynne Hershberger: As a mother who lost a child to adoption, I can say that I had the same experience as Reanne but through Catholic Social Services in 1980. One part I highlighted in the book: "’If you want to look at what's wrong with international adoption, state adoption, and Christian adoption,’ one agency director told me, ‘it all has to do with how they treat birthmothers. The common denominator in all of these is that the birthmother is invisible.’"
I agree, we're not here to bash any particular religion or people of faith. It's the system that is wrong. It is good to see the Christian writers acknowledging that something has to change and being open to discussion but it's distressing to see the people who claim to be Christians out and out lying about their role in the industry. In one part of the book Joyce talks about Jim Wright and Birthmothers—aka Birthmother Ministries on Facebook. I spoke with Jim personally. We had a long phone conversation where I asked him repeatedly about the role of his ministry and adoption, and he claimed that they were not at all focused on adoption. Yet, he is quoted in the book as saying "The reason we use 'birthmothers' as our name is because it connotes adoption." And he says, "That's how Birthmothers came to be: because we go to adopt, and we can't get anybody to do a homestudy." In my conversation with him, he stressed that they don't push adoption and could only speak about his own experience as an adoptive father. Rebecca: Also, we've mentioned it already, but the numbers manipulation comes up again in this section of the book, as when a Christian crisis pregnancy ministry argues that all children born to single mothers in the United States are orphans because the biblical definition of an orphan is a fatherless child. "If 43 percent of the six million babies born that year were born to unwed mothers, the ministry reasoned, 'that means 2.6 million new orphans last year!'" Excuse me? I find the redefinition of "orphan," in both domestic and international contexts, to be frighteningly Orwellian. "Birthmothers." "Orphans." The language choices are deliberate and manipulative. "Orphan" tugs at the heart strings and obscures the fact that we are primarily talking about children who already have parents . . . just not the "right" parents in the eyes of the orphan-crisis movement. Mila: Wow. This is a great discussion. As a Korean adoptee, although I do not adhere to the Korean brands of Buddhism or Confucianism, it has been so enlightening to learn about the history of these religions/philosophies and how they have affected the family (and ultimately, adoption) culture in Korea. I state this to say that I agree that it can be very valuable to expose adopted children to the religions/philosophies of their origins. One of the things that has stood out most to me thus far in The Child Catchers is the "rebranding" of "birth mother" that Joyce discusses on pages 114-117: "Based on this research, Young suggested a new CPC communications strategy that would 'chip away at those associations and establish new ones,' presenting adoption as an expression of birthmothers' selfless love as well as a means of redemption—a way for mothers to 'defeat selfishness, an evil within themselves.'" I found this disturbing and disgusting. A so-called Christian organization hired a marketing company that describes itself as studying consumers' "subconscious emotional motivators" so that companies can "leverage their brands as never before." Talk about manipulation. This is sickening. I think this decision to "rebrand" birth mothers was pivotal (in a very bad way) for the adoption movement. And it's ubiquitous now in the adoption community. Completely takes advantage of the emotions of women dealing with unplanned pregnancies or otherwise. Reading about this made me want to fight some people! Karen P.: I agree, Mila. I realized while I was reading this part about birthmothers that I not only write about adoption to give voice to the adoptee viewpoint, but also to hopefully help put an end to the sense of shame that surrounds birthmothers, including my own. There is no need for these women to feel they are evil or that they've done something that needs to be hidden. Joyce makes the point that the adoption industry has been successful in promoting "positive adoption language" in order to paint a rosy picture of relinquishment. They have the money to be able to launch massive media campaigns to influence public opinion. We need an equally powerful counter movement to offset this control. The work that adoption reformers do is immensely important, but it seems like it's not enough. How much more influential could reformers be if we could find a way to fund our own national media campaign to educate the public on the truths of adoption? Mila: Wow, Karen. I can't believe I've never thought about harnessing media campaigns to educate the public about the complex truths of adoption. You're a genius. Lynn: Karen Pickell is a genius! We need to do that!!! Karen P.: I'm new at this, so I'm sure others have thought about it, and I'm equally sure it must be prohibitively expensive which is probably why it hasn't happened. Susan Perry: Your comment is so perceptive, Karen. How do we educate the public about the truths of adoption when "positive adoption language" promoted by the industry has been so successful in presenting relinquishment as a positive, clear-cut thing? I've often thought the problem is one of numbers—we need so many more people to speak out, yet I understand why many are reluctant. But we also need a coherent national strategy. How do we put that together? Karen P.: The American Adoption Congress has its "No Secrets, No Fear" campaign, but how many outside of that community have even heard the slogan? Mila: This is the first I've heard of it. I think you're right—it's the money issue. But of course it is. Those with the money have the power—as perfectly exemplified in modern adoption! Deanna Shrodes: There have to be people in the adoption reform movement who have these gifts and might be willing to donate their time to production? 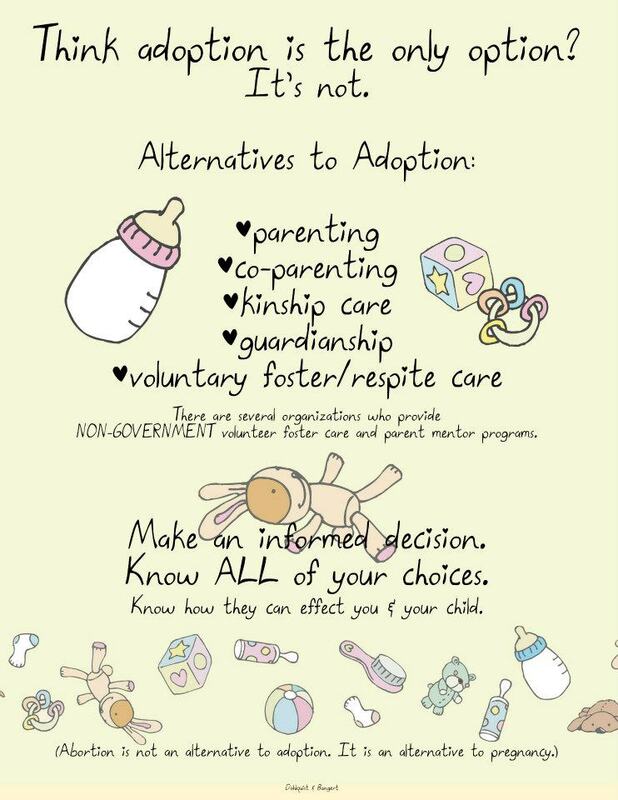 Carlynne: Have ya'll seen the graphics going around done by Kate Dahlquist about educating yourself on adoption? I think those would be fabulous to get out on a large scale. Lynn: Yes, we could use free Facebook, which is more powerful than those silly ad campaigns. Rebecca: I love your idea, Karen. One of the understandings that gelled for me in reading this book is of just how effective the pro-adoption movement has been in terms of propaganda. And it goes well beyond the Christian community. I would guess that many people in the general public subscribe to the idea that there are many children around the world languishing in orphanages; therefore, it is natural to assume that adoption is a good thing because it gets these children out of institutions and into families. On the surface, that seems like a no-brainer. And certainly, many of us who speak out against the current practices of adoption have encountered the criticism that we are heartlessly uncaring towards "all those kids" stuck in horrible orphanage conditions. Child Catchers does an effective job of showing how the orphanages and the adoption [industry] are bedfellows. For example, "In Cambodia, after adoptions were suspended, the number of infants in orphanages plummeted almost immediately: an indication to adoption reformers that the international adoption system and the revenue it generated was the only reason many babies had been placed in institutions." But how do we get information like this out? Carlynne: Without the resources of the industry, I guess we start with doing what we're doing now but do more of it . . . Facebook, Twitter, blog, etc. info from this book, share the book and excerpts from it on a regular basis. Mila: Rebecca, you ask a valid question. There is so much resistance to the truth, I think in large part because this is such an emotional, and often religious, issue. People don't want to hear it. And often the ones who need to hear it the most avoid it like the plague. Karen P.: I think Susan makes a good point, too, that this level of campaigning would not only require money but also a comprehensive strategy. Mila: As Carlynne just stated, using social networking sites and blogs are actually making a difference and getting the truth out there. But anything like this is going to be slow going. It runs so deeply and pervasively. Karen P.: Also, let's remember that those promoting adoption aren't just doing it out of the goodness of their hearts—in most cases, they are getting paid! Carlynne: I deal with this in my own family. I have a cousin who adopted a newborn and they've bought the propaganda fully. I've tried sharing info like this with them and all I get back is, "All those babies are just going to end up in foster care anyway." Last thing I asked him was . . . does that mean you believe my daughter would have been neglected or abused and ended up in foster care? That's the last time we spoke. Learning the truth shakes the foundation of what they believe so they can't go there. Lynn: Great points, Rebecca. I like the idea of using the graphics on Facebook to list specific points like the one you pointed out: "International adoption halted—orphanages close." If people can understand that basic concept, it might suddenly dawn on them that we are creating more "orphans" by our own actions and that the orphan terminology has been used so loosely (when 80% of these kids actually have families). The Baby Scoop Era came to an end eventually—hopefully The Orphan Crisis will end very soon. Karen P.: I do find it encouraging that this book, The Child Catchers, is already receiving so much media attention. I hope the discussions instigated by Kathryn Joyce's thorough reporting will continue to grow and will begin to infiltrate the adoption propaganda machine. Mila: The only thing about things like Facebook and graphics are that those who need to challenge their thinking about adoption will not do so by being exposed to graphics. It requires a more personal element. It's like politics—ain't no Dem or Repub gonna be changed because they happen to stumble across a graphic. I really wish more adult adoptees were given the opportunity to present at some of these conferences and seminars, etc. for adoptive parents and advocates. I think when adoptive parents and advocates are forced to face adoptees and birthmothers in person, it changes the dynamic and makes things much more personal (for everyone involved). Lynn: Good point, Mila, about the graphics . . . however using Facebook, Twitter, etc. to further the facts against what the adoption agencies are touting would be useful. Maybe we will have to get political at Lost Daughters and speak out against some of these practices if we can all agree on a collective position. Part 3: orphanages, deception of adoptive and original parents, and coercive tactics employed by the adoption industry.